I know it’s barely spring, but before we know it summer will be here! Warby Parker is getting you ready for the beautiful, bright days ahead with their recently launched Sun Spectrum Collection. A colorful collection of nine new styles, including the Warby Parker Sunglasses – Minnie in Eucalyptus and the Warby Parker Sunglasses – Hall in Whiskey Tortoise with their debut triple-gradient lenses, featuring three rich colors that are exclusive to Warby Parker. That added punch will help with those extra hours of daylight. 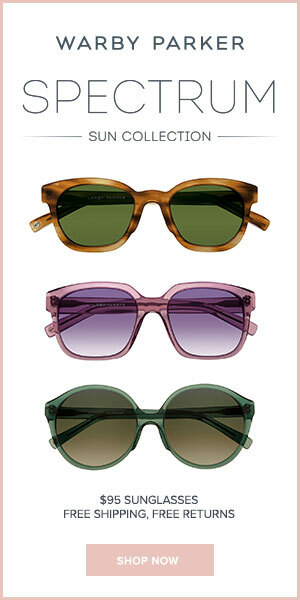 You can view the full Sun Spectrum Collection, here:http://www.warbyparker.com/spectrum-sun. There is more exciting news – Warby Parker has opened a new New York storefront! The new store will be located on Lexington Avenue and will feature the original marquee, a photo booth to test out your new frames and and pneumatic tubes that move inventory through the store! If you are in or around New York, be sure to check it out! This entry was posted in Uncategorized on March 27, 2014 by Chrysa. I’m loving that mauve pair in the middle!